Currently, the biggest legal threat posed to ObamaCare comes from the D.C. Court of Appeals’ recent ruling against ObamaCare subsidies (Halbig v. Burwell). The IRS has been issuing the subsidies in 36 states where the federal government operates insurance exchanges, while the plain text of the ACA makes health insurance subsidies available only in states that have set up their own exchanges. By deviating from the ACA’s language, the IRS actions significantly increase the number of people forced to either purchase insurance they otherwise wouldn't want or can't afford, or pay the penalty enforced by the individual mandate. After the D.C. Circuit Court ruled against the IRS, the DOJ filed a petition asking for an en banc review from the full D.C. Circuit. That petition has been granted, and now the full panel of judges recently packed with Obama appointees will rehear the case in December. Thirteen judges will rehear. Halbig v. Burwell; two senior judges who already heard the case will not vote. Eight of these thirteen judges were appointed by Democrats, five by Republicans, and four were appointed by President Obama himself. Using a tactic known as the “nuclear option,” Senate Democrats used a simple majority vote rather than the traditional sixty votes, to end a judicial nominee filibuster. Republicans claim this was done in order to pack the D.C. Circuit Court, which hears many cases regarding federal laws and regulations. The standard precedent for major rule changes was to attain two-thirds majority, that is, before Harry Reid led this charge. Previous majorities have attempted to eliminate this filibuster, but didn’t dare rely on a simple majority to do so. 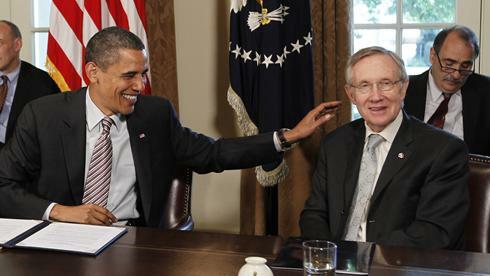 In fact, Mr. Reid has been an outspoken critic of using the nuclear option in the past. When reporters asked whether use of the nuclear option was vindicated in light of the Halbig ruling, Reid said based on “simple math, you bet.” Predictably, a court packed with Obama nominees is more than likely to rule in favor of ObamaCare and IRS authority. Presently, there are conflicting rulings on the subsidy question between the D.C. Court of Appeals and the 4th Circuit Courts decision in King v. Burwell. In King, the court found the language regarding the subsidies to be ambiguous and applied deference to the IRS’ interpretation, thus deeming their actions as permissible. If the en banc panel overturns the previous D.C. Court decision, this would eliminate the discrepancy between the circuit courts and lessen the chances the Supreme Court takes up the issue. While the Supreme Court could find this case has exceptional importance, consistent rulings favorable to the IRS would diminish the need for Supreme Court intervention.